The holiday season is in full swing, and as you’re planning family gatherings, celebrations and shopping sprees, you should also take some time to plan ways to keep your aging loved ones safe during this time of year. While this is a wonderful time of food, friends and family, there are also hazards and difficulties that seniors and their loved ones must address. 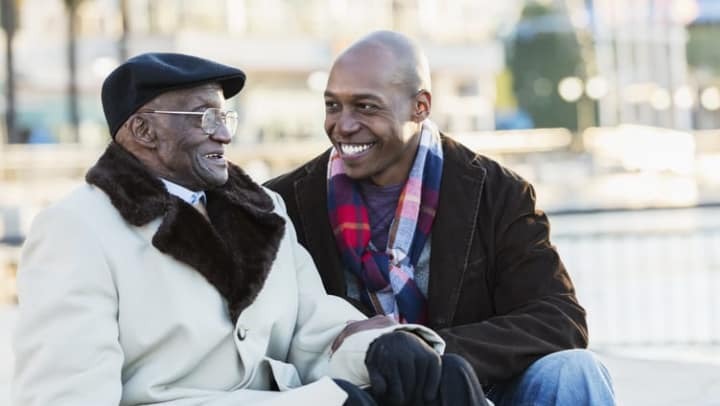 Here are some tips for helping keep your aging loved one safe, whether they live on their own or with you. Eating, drinking and making merry is a beloved tradition this time of year, but while most of us can bounce back after a binge, older adults with health issues may not be so lucky. Rich, salt- and sugar-laden foods can cause digestive issues, interactivity issues with medication and can aggravate the symptoms of dementia and Alzheimer’s disease. If seniors will be present at your holiday party, you’ll want to make sure they can enjoy what’s offered while not diverting too much from their dietary needs. ● Eat healthy meals before a holiday party. A light meal of fruit, vegetables and lean proteins will help fill seniors up with good nutrients and stave off hunger so they’re less tempted to reach for those cookies and dip. This can also help seniors stay on a regular dining routine – always important. ● Take a healthy dish to pass. If you’re attending a party, bring a light appetizer or salad to pass around the table. That way, everyone can enjoy a healthy treat, without having the senior feeling left out. ● Stay hydrated. It’s easy to become dehydrated when schedules are interrupted with parties, errands and more. Keep a bottle of water in the car or in a purse in order to easily keep thirst at bay. Drinking enough water will also keep seniors from overeating or drinking too much alcohol. ● Help your loved one the day before. Make it casual. Ask your loved one if they would like some company as they’re preparing, and while you’re over there, you can easily help out with anything that’s needed. ● Offer to host the gathering at your home. Be sure to allow your loved one to play an important role, like bringing one of their famous dishes. ● Keep floors clear for foot traffic. Remove rugs, say no to floor dècor and make sure electrical cords are out of the way to avoid causing falls. ● Securely fasten trees into their bases. The last thing you want is for those lovely branches to come a-tumbling down. ● Inspect lights and electric cords before plugging them in. Discard any damaged or broken strands and replace burned-out lights. ● Set a timer to turn lights on and off. Leaving lights on all night can be a fire hazard, so instead of relying on memory alone, set a timer to shutdown the show at bedtime. Sure, you or your senior may stay up a little later than usual rocking around the Christmas tree – it’s to be expected. However, be sure that routine doesn’t get too off from normal, and be sure there are opportunities to nap if your loved one gets overextended. Regular schedules are good for everyone, and getting enough sleep is critical to helping your loved one stay healthy. ● Get a flu shot. ● Eat plenty of fruits and veggies. ● Use hand sanitizer often, and wipe down shopping cart handles with antibacterial wipes. ● Wash hands frequently, especially after being in contact with someone who is ill.
● Be sure a charged cell phone is available at all times so your loved one can contact help even if land lines go down. ● If your senior lives away from you, ask one of their neighbors to check in the event of inclement weather. ● Check heaters, fireplaces and heating systems to make sure they’re properly ventilated and in working order. ● Close off rooms that aren’t used often, and consider covering the windows and plugging the doors to keep heat from leaking out. ● Prepare a list of emergency numbers and keep it by the phone. ● Listen to weather reports, and have a battery-powered radio handy so you can stay aware of alerts and warnings. ● Be sure there are plenty of blankets and extra warm clothing at hand. ● Make an emergency stash of food, water and medications. Choose foods that don’t require cooking and have a lot of energy, like dried fruit, nuts, peanut butter and granola bars. For more information about holiday safety tips for seniors, please contact the team at Aspired Living® of Westmont in Westmont, IL. We would be glad to give you some insider advice and explain how we help our residents live a fulfilled, enriching life in our Independent, Assisted Living and Memory Care community. Now open and offering Independent Living, Assisted Living and A Knew Day® Memory Care, Aspired Living® of Westmont in Westmont, IL, inspires residents to Live Well. Age Well. Be Well. Upon arrival at Aspired Living® of Westmont, you will find a beautifully designed community full of engaging programming and compassionate care that is changing the way society thinks about aging and senior living. With the choice of studio, one- and two-bedroom apartments, residents can have the space they desire as well as access to gracious community amenities from multiple dining options in either The Sycamore Restaurant, the Outdoor Terrace Café or the Prairie Grass Bistro to opportunities to lounge in the Sundara Spa and Salon, outdoor gardens, technology center, art studio, the Twin Lakes Movie Theatre or the Oakwood Library. Residents even benefit from the peace of mind of 24-hour access to care whenever it’s needed. It is clear Aspired Living® of Westmont was designed for living well. Offering an active, engaging and fulfilling lifestyle, residents can focus more on what they want to fill their days with, whether that means relaxing in the comfort of their own apartment or taking advantage of VIVA! programming by Pathway to Living®, residents are free to live their days as active or as relaxed as they choose, all while never needing to worry about making another move. With all forms of care available on site, including a groundbreaking memory care philosophy offered solely in the United States by Pathway to Living® called Spark of Life® that is proven to rehabilitate the brain – a process called rementia – lifting the spirit and awakening dormant abilities, including speech, residents never have to worry about giving up the lifestyle they love and deserve. Learn more or schedule a tour today by calling us at 630.749.2566. Disclaimer: The articles and tip sheets on this website are offered by Aspired Living™ of Westmont for general informational and educational purposes and do not constitute legal or medical advice. For legal or medical advice, please contact your attorney or physician.